NOW THAT’S A NICE SLICE! Stowe, Vermont is the ultimate New England ski town and when you think of skiing you think of après ski and when you think of après ski you think of pizza, beer and good music. All three of those things should lead you to Piecasso Pizzeria & Lounge. When I recently discovered that Piecasso had been voted “Top 11 Slices in the Country” by Travel & Leisure Magazine, I knew I had to make a stop there on my recent trip to Stowe. Now, let me explain something. My partner Melanie and I are Italian. We KNOW pizza. I grew up in the ‘Federal Hill’ Italian neighborhood of Providence, RI and Melanie on the New Jersey/New York border. I can honestly say that we’ve had our fair share of some of the best pizza around (Caserta’s Pizzeria, need I say more?) However, Piecasso is in a league of its own. Restaurant manager, George, was kind enough to host lunch for Melanie and I on our way out of town, Sunday. I wish we had more time to stay and enjoy the youthful, cozy, atmosphere and more room in our stomachs to sample different pizzas, but we did what we could and, wow, what an experience! I love the building the restaurant is housed in. It was very inviting with its pale yellow & white exterior and sunset colored door. The moment Melanie and I stepped inside we were hit with its youthful, vibrant ambiance. Lady Gaga was singing about her “Poker Face”, the bar already had patrons enjoying a cold beer and the staff, both good looking and friendly, greeted us with warm smiles and quick service. The decor of the restaurant is contemporary. It felt as if we walked into a Picasso painting. Colorful art hangs on the wall which complement the brown, wood floor and sleek, black tables and chairs. I could hear some of the workers singing along to Lady Gaga, which made me want to join in. The staff had that “hacky sack” vibe that screams Vermont. Really cool young adults. We arrived shortly after the restaurant opened, around 11:30am. Unfortunately our stomachs wouldn’t allow us to order much food. Melanie started out with a garden salad with maple-balsamic vinaigrette. We then shared a large Pesto Delight Pizza and Tiramisu for dessert. Melanie’s salad was quite large compared to other garden salads ordered in the past. It consisted of Romaine lettuce, tomatoes, red onions, cucumbers and carrots with a maple-balsamic vinaigrette. The vegetables were extremely fresh and the dressing thick and sweet. Two thumbs up for the salad! 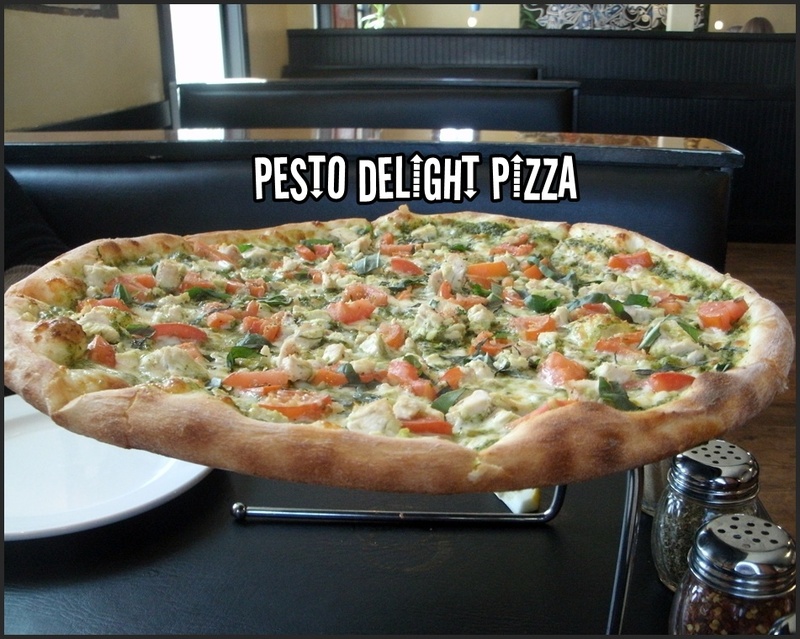 When our waitress, “KJ”, came out with our Pesto Delight pizza, I was amazed at the size! I could smell the fresh basil, garlic and pesto and couldn’t wait to sink my teeth into a slice. Melanie said, “Now THIS is New York style pizza!” It was so good it hurt. The pesto base with mozzarella, fresh basil, garlic and tomatoes covered in grilled chicken fit together like soulmates. None of the flavors were overpowering. They complimented each other perfectly. According to Picasso’s web site, owner, Eduardo Rovetto, learned the pizza business at a young age from his parents, Quinto & Rosa, both originally from Sicily. There are 10 Rovetto family pizzerias on the East coast. 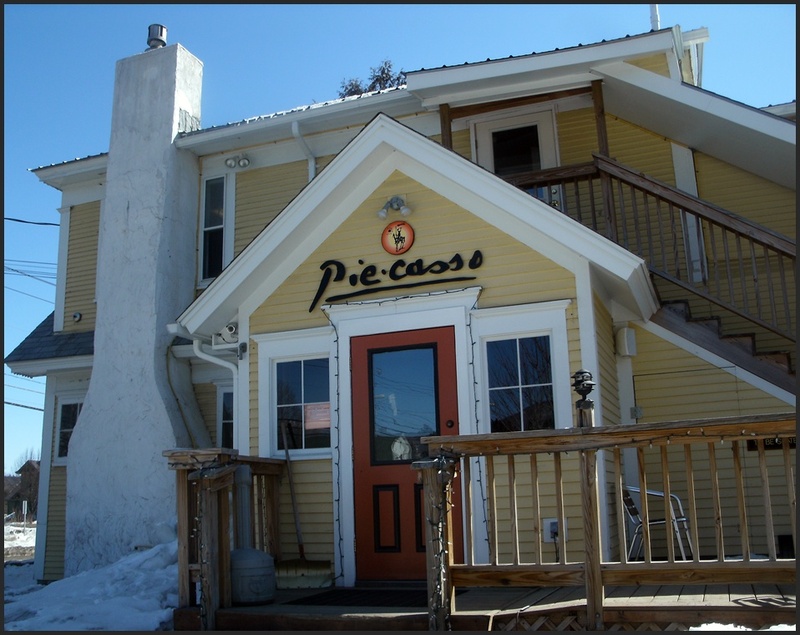 Ed opened up Piecasso in 2000 in a tiny location at Gale Farm Center in Stowe. 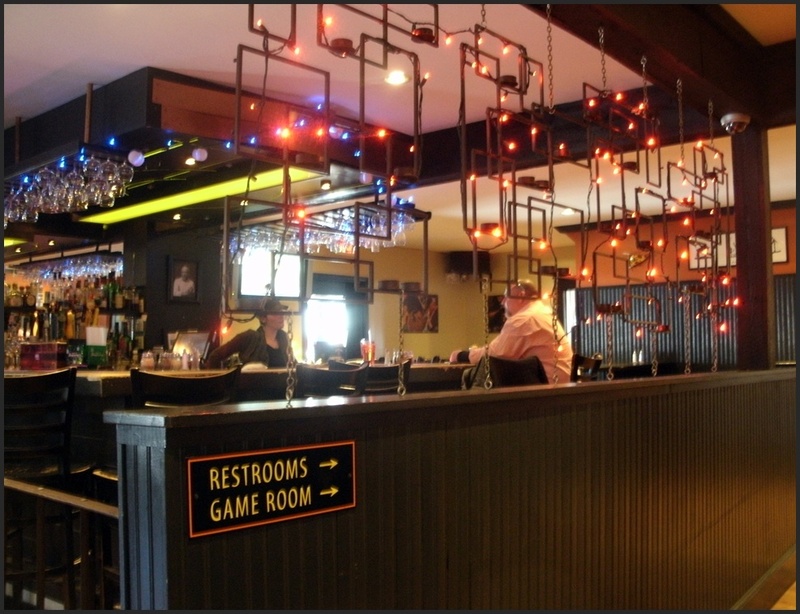 Due to its success, Ed decided to buy the Old Grill 108 building and expand Piecasso into a full restaurant, bar, and lounge. The result is Picasso Pizzeria & Lounge which opened in February, 2006. Piecasso’s web site words it best when it says it is a fun place filled with modern style, eclectic music, and great vibes. And let’s talk Pizza. Truly unbelievable. I hate to say it, but they would give pizza parlors up ‘Federal Hill’ in Providence, RI a run for their money. It is that good. Then came dessert — the largest piece of Tiramisu Melanie and I had ever seen! I quickly shot down the “guilty” voice inside telling me I better go to the gym 24/7 this week and savored my first bite. Holy Mother. I mean no disrespect, but that is what comes to mind as I type this. Holy Mother. 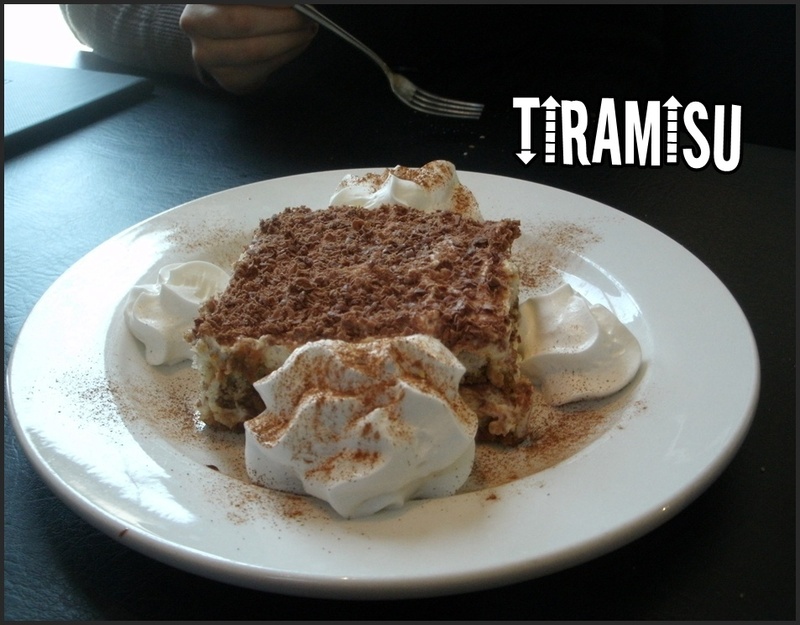 The Tiramisu was served with whipped cream which complimented the coco and mocha flavor perfectly. It was so creamy and ice cold. It had shaved chocolate bits on top which added to more of a chocolate taste than mocha, which I personally loved. Melanie and I got into a “fork war” trying to steal the last bite. I could’ve eaten an entire pan and not felt guilty (okay the not feel guilty part is a lie). We left happy & full with huge smiles on our face. We even had some pizza left over for the drive home. Melanie and I return to the Stowe area on April 9 and we already have a stop at Piecasso planned. It’s going to be tough deciding what to try next off their amazing menu. It’s hard to say what the REAL gay & lesbian vibe is since we were there at 11:30am on a Sunday, but I can tell you that George eagerly responded to our request to feature Piecasso as a gay friendly establishment. The staff was very friendly to Melanie and I and, let’s be honest, this is Vermont. Gays & Lesbians are pretty much accepted everywhere! You must make a stop at Piecasso when in the Stowe area, trust me. I am hearby “OUTING” Piecasso as a gay & lesbian friendly establishment worthy of our business. ← Stowe Cabins in the Woods – Perfect, Gay and Lesbian Friendly Accommodations! 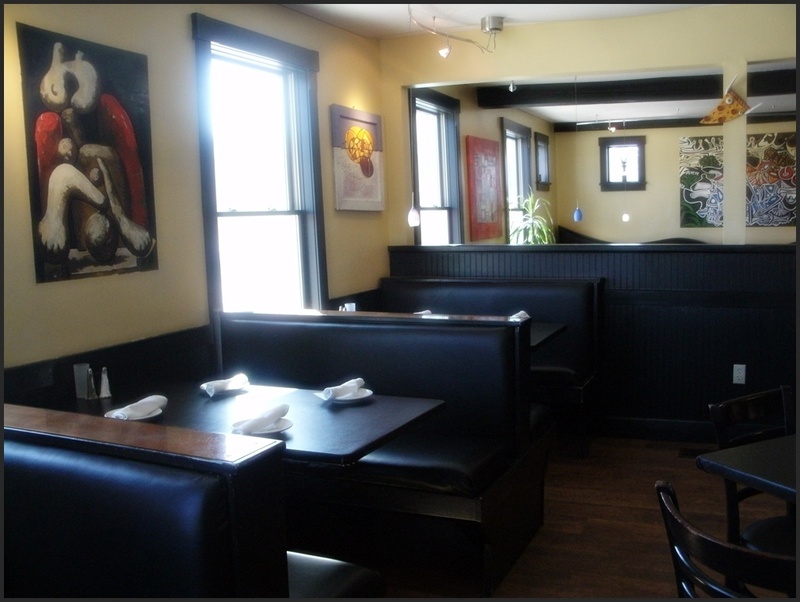 That pizza and that dessert looked amazing…….We will surely stop by the next time we are in Vermont…..can’t wait! !